I’m not going to get too far into the marketing aspects, as we’ve heard all of this information before: AMD has improved Enduro Technology, they’re continuing to improve their drivers, and APP Acceleration has a few more applications. There have been a few major titles released in the past couple of months with AMD Gaming Evolved branding (Far Cry 3 is arguably the most notable of the offerings, with Hitman: Absolution and Sleeping Dogs also scoring well amongst critics and users), and Bioshock Infinite is at least one future release that I'm looking forward to playing. Obviously there are a lot of missing pieces right now, but what we immediately notice is that the core count on the 8500M/8600M/8700M means that we’re definitely looking at a new GPU. The only other time we’ve seen AMD do 384 cores is with Trinity, but that’s a VLIW4 architecture so we’re not seeing that again. Given the currently shipping Southern Islands chips (“London” on the mobile side) have 640 cores max for Cape Verde, 1280 max for Pitcairn, and up to 2048 for Tahiti, AMD has likely created a fourth SI derivative that drops down to two CU arrays, each with three CUs. 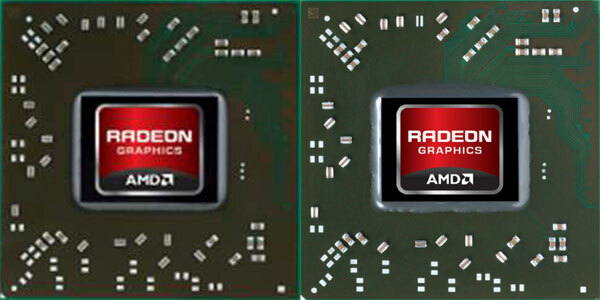 (You can read more about the GCN/SI architecture in our earlier GPU coverage.) Performance is something of a wildcard with the new 384 core parts, and the choice of DDR3/GDDR5 memory will also influence the final result. We'll find out in the coming months how the 8500/8600/8700M stack up to NVIDIA's midrange "GT" offerings, which interestingly are also using 384 cores. Also worth a quick note is that AMD is not discussing TDPs at this point in time—which is common practice for both AMD and NVIDIA. We expect the new "Mars" parts to be more power efficient than the outgoing Thames/Turks cores, thanks to the shrink to a 28nm process. However, AMD and NVIDIA typically stick to common power targets for laptops that are dictated by their OEM partners, which often means they'll play with clock speeds in order to hit a specific TDP. That's why all of the clock speeds listed in the above table have a qualifying "up to" prefix (which I omitted). The final announced card is the one where we appear to have more of a rebrand/optimization of a previous generation chip. 8800M has the same 640 core count as Cape Verde/7800M, only with modified clocks this time. The earlier 7800M chips could clock up as high as 800MHz, so maximum core clock is actually down a bit, but they only ran the memory at up to 1GHz (4GHz effective) GDDR5. If AMD determined memory bandwidth was more important for that particular GPU than shader performance, the new 8800M would make sense. Also note that AMD isn’t including the boost clock speeds into the above chart; under the right circumstances, all of the new chips can run at higher clocks than the reference clock. I’ll refrain from commenting too much more about performance of an unreleased part, but AMD indicated their 8870M should be substantially faster than NVIDIA’s current GT 650M GDDR5 (which isn’t too surprising considering clocks and core counts), and the 8770M should likewise be a healthy 20%+ bump in performance relative to the 7670M. I’d rather see comparisons with GTX 670MX and HD 7770M, respectively, but I suspect those wouldn’t be quite as impressive. 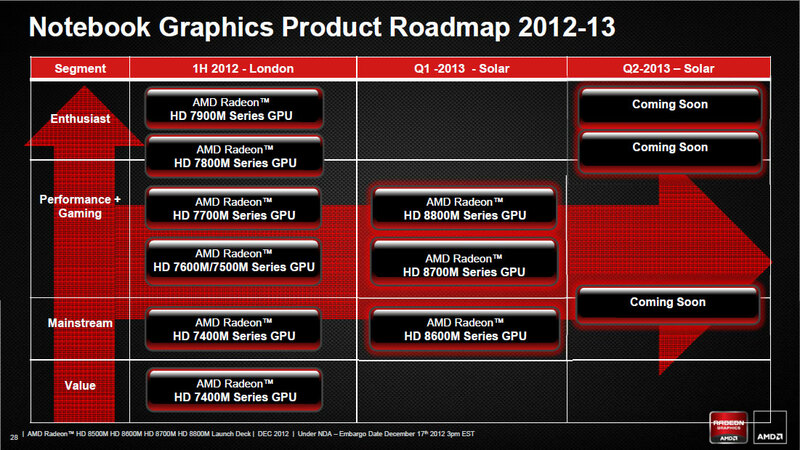 Anyway, you can see AMD’s comparison charts in the complete slide deck gallery below. 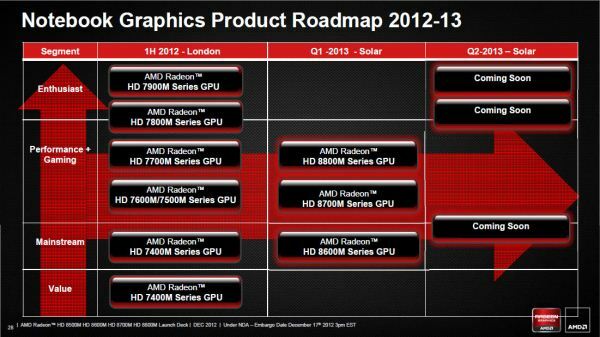 Availability of the new GPUs is slated for Q1 2013. Maybe they should have an actual product in the reviewers hands first, instead of the phantom product with the PR 100% campaign taking front and center ? Actually, with Steam coming to Linux it wouldn't be a terrible idea betting on the gaming market share of Linux going up a small amount. If they could become the de facto GPU in the Linux space, I'd say that's worthy of putting effort in. AMD needs to be making bets right now, playing it safe isn't going to save them from bankruptcy in the future. Imagine if they did that? Gamers, and other enthusiasts building their own systems from scratch, might then completely overlook Windows, and use the free option. Who knows what skills the community could offer to them in improving drivers? TRUST ME, I'm no Penguin hugger, I FIGHT with Linux, not use it. With the arrival of Steam, the take up of Linux would be seriously re-considered if the drivers went open source... and given the Win 8 release (stealing my start menu, when everyone seems to want it! ), it might force MS to actually listen to customers once again. I am surprised that there is so little porting going on from PlayStation 3 titles to linux, given the fact the the PS3 already is running a linux-derivative. At the same time, about 80% of big game titles coming for the PC are already portings or co-developments from/with the XBOX 360.